1. Dry fry the walnuts in a small frying pan for a minute or 2 until lightly browned. Place in a small food processor with the garlic and chopped anchovies. Whizz to combine. 2. Strip the leaves from the watercress and add them, along with the vinegar, olive oil and some seasoning, to the processor, in batches if necessary. Whizz to a bright green purée. 3. Heat a griddle pan until smoking or heat the grill and cook the salmon on both sides for 4-5 minutes until browned and just cooked through. 4. Cook the vine tomatoes alongside the fish, turning once. 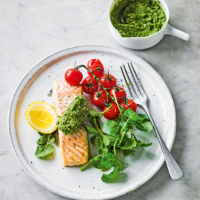 Serve the salmon with spoonfuls of the watercress pesto, lemon wedges, tomatoes and extra watercress dressed with lemon juice and a little extra virgin olive oil. Cook’s tip Use the remaining pesto in other recipes – it’s great tossed through cooked rice or spooned onto soup before serving.